Then a tragic accident changes her life forever. Sounds like a classic story you’ve heard before. But then, because Dani Atkins knows how to reel you in: hook, line and sinker, you continue reading -- and, you are glad you did because this is, unarguably, unlike any story you’ve read before. Five years after the tragedy, Rachel returns home for the first time since the accident. She’s back for her best friend’s wedding, but she isn’t prepared for the memories that taking that journey may elicit; memories that she had schooled herself to bury deep and not allow to surface. Rachel has already declined to be the maid of honour, much to her best friend’s dismay. But even attending the lead up events to the ceremony puts her in a pill-popping mood. She doesn’t really think she is strong enough to face that particular brand of crazy in the run up to the wedding. Her greatest fear is how she would cope with seeing everyone in one place for the first time in years. And truth be told, it wasn’t a reunion with the living that was going to be so hard to live with. Five years may not seem like such a long time. But then neither may a three-day trip for a wedding. Even before she arrives she longs to get back to the anonymity of the big city where she relishes living where no one knows your name. She had accepted what had happened (well, to some extent) but this trip is making her realize that all she had done is put a thin plaster over a gaping wound. The veneer of being at peace is about to be unceremoniously scratched away. This is a book that has it all. Addictive. Romantic. A keep-you-guessing plotline that’s on its way to becoming this summer’s beach novel, at least for folks who enjoy YA novels sprinkled with a healthy dose of boy meets girl/boy becomes girl’s best friend and she’s clueless. Then And Always is a fun book for those looking for a quick read, although it’s not just all about romance with a side plate of cheese. There are twists and turns in the novel that keeps nagging you till the end. And even then, you may just continue wondering. I am a bit curious as to why the UK release is named Fractured instead of Then And Always. 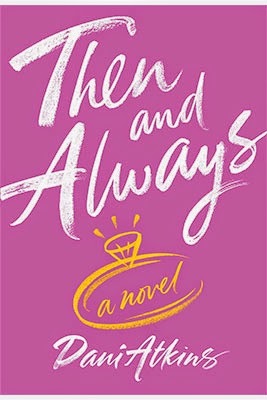 Then and Always by Dani Atkins is published by Penguin Canada Books Inc.